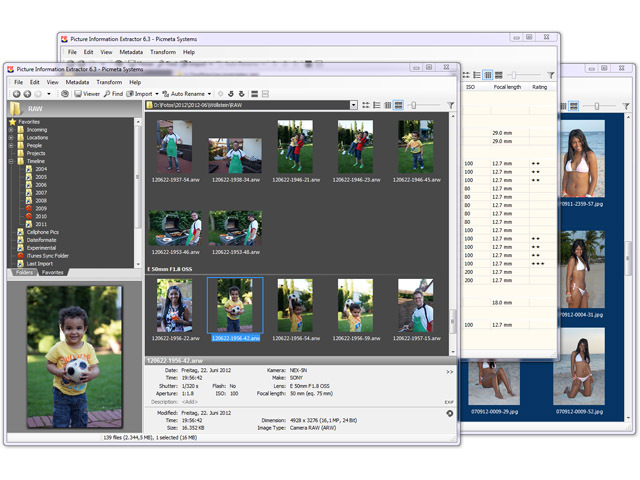 Deluxe viewer and photo metadata toolkit. PIE is a free image browser and viewer with perfectly integrated photo metadata and file renaming features. It extracts EXIF, XMP and IPTC information from JPG, TIFF and RAW files and makes it available in a convenient and welcoming interface. Its metadata engine is based on ExifTool which provides the most complete metadata repository currently available. At the same time, with PIE's unique multicore ExifTool control, scanning and searching metadata is blazingly fast. * Unique multicore control provides the fastest possible access to the ExifTool based metadata engine. * Download from memory card to your computer. It automatically creates a folder structure, moves or copies photos and videos, renames them as defined in the filename mask, and rotates photos taken in portrait mode. * Fast integrated picture viewer, of course with image preloading, zooming and panning, as well as slide show features. * Convenient picture file manager. Move, copy, delete and rename picture files. * Support for Sony .ARW .SR2, Canon .CRW .CR2, Adobe .DNG, Epson .ERF, Kodak .DCR .KDC, Mamiya .MEF, Minolta .MRW, Nikon .NEF, Olympus .ORF, Pentax .PEF, Fuji .RAF, Generic .RAW. * Quick batch change of capture date/time, works with JPG and RAW formats. * Remove EXIF, IPTC and/or XMP headers from JPG-files. Hold Image 2 - [Viewer] is a part of the Hold Image 2 DRM system.